The wait for Vega continues, as does AMD's teasing. AMD held a tech day for the press on Tuesday, and while the focus was squarely on the new AMD Ryzen pricing, release date info, and performance, some new tidbits about the hotly anticipated Vega graphics cards were quietly revealed, too. First up: The Radeon Vega logo, which appeared in an overview slide shown to the press, as you can see in the image below. We’ve zoomed in on the logo for this article’s headline image for your viewing pleasure. Cameras caught the Radeon Vega logo in a slide at AMD’s Tuesday presentation. 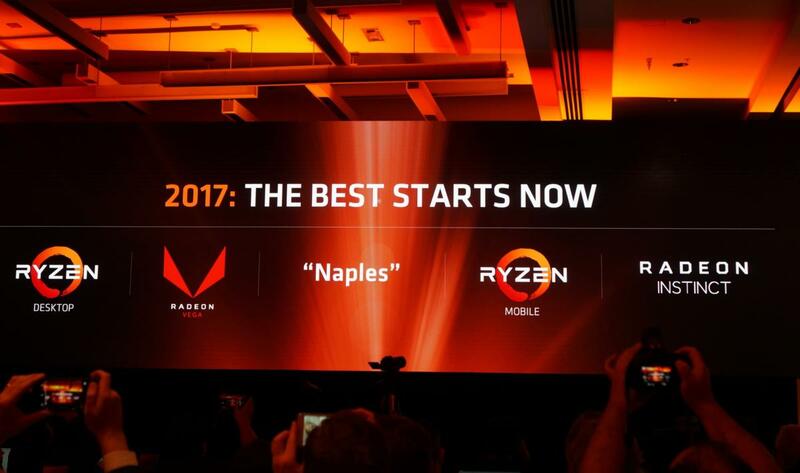 The company apparently didn’t want to reveal the Vega logo yet, as it’s been awkwardly removed in AMD’s video of the Ryzen presentation on YouTube. Cameras don’t lie, alas. Ignore the funky USB header and whatnot. As Paul says, it’s only there because this unit is an engineering sample. It’s clear the enthusiast-class Vega card carries on the sleek design cues that originated with the Fury lineup and continued in the RX 400 series. The only practical information gleaned from the reveal is that the card uses an 8-pin and a 6-pin power connector, proving that Vega is indeed more power-efficient than the Fury X, which relied on dual 8-pin connectors. No great surprise there. Radeon Vega doesn’t have a firm release date, but AMD says the card will launch in the first half of 2017. Want to know more? AMD’s holding a “Capsaicin” livestream on February 28, where more Radeon Vega details will no doubt be teased. In the meantime, check out PCWorld’s coverage of the five things you need to know about Radeon Vega based on a technical preview and hands-on event, and tune in below as PCWorld’s Full Nerd crew discusses Vega vs. Nvidia’s incoming GeForce GTX 1080 Ti, Ryzen, and a whole lot more.